Duke wrote a telnet program for the wifi M4 board, whose sources are now available since the start of August. To compile the source with RASM (Windows), here are the how-to. The source code of SymTel for SymbOS is also available. The last version of RASM is v0.90 (27th June 2018). This multi platform assembler/disassembler (linux, windows, but not only like MorphOS on Amiga) let you program for Amstrad CPC. The french video is about the new features of RASM. 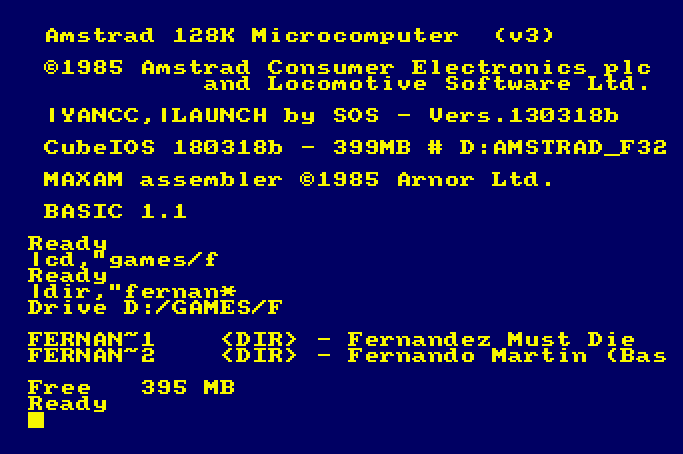 The version 2 will be showed at the meeting Reset #30 with fullscreen mode and Amstrad CPC+ support. The last version of RASM is v0.86 (27th April 2018). This multi platform assembler/disassembler (linux, windows, but not only like MorphOS on Amiga) let you program for Amstrad CPC. CubeIOS is out, but AST is still working on his ACMEDOS replacement : IMPDOS for the mass storage extension card XMASS. A new version of YANCC (Yet Another Norton Command Clone) is available (130318b). It's a text interface to manage your files on the X-Mass and the AcmeDOS ROM with an interface which looks like norton commander or midnight commander). In rare circumstances, some files are copied empty. It's this new version which is needed if you want to use the new ROM CubeIOS which replaces ACMEDOS. Detect (nearly) all Fat16+Fat32-Partitions on your CF-Card, DOM, etc. (1st Partition please). Prefered is Fat32 (should be faster with Save-Commands). You can format the media with e.g. Windows and fill it with data. Compatibility should be high (i hope so ;) ) - but i'm playing around with a lower-rom-patch to increase compatibility. The ROM must be placed below AMSDOS and (if used) M4DOS, PARADOS. It's not compatible with ACMEDOS at the same time. YANCC-User should be update to the latest version. After chess, the wifi M4 Board has another use : connecting to internet with the telnet protocol (beware, it's not secured) thanks to Duke who programmed it for his wifi M4 Board.